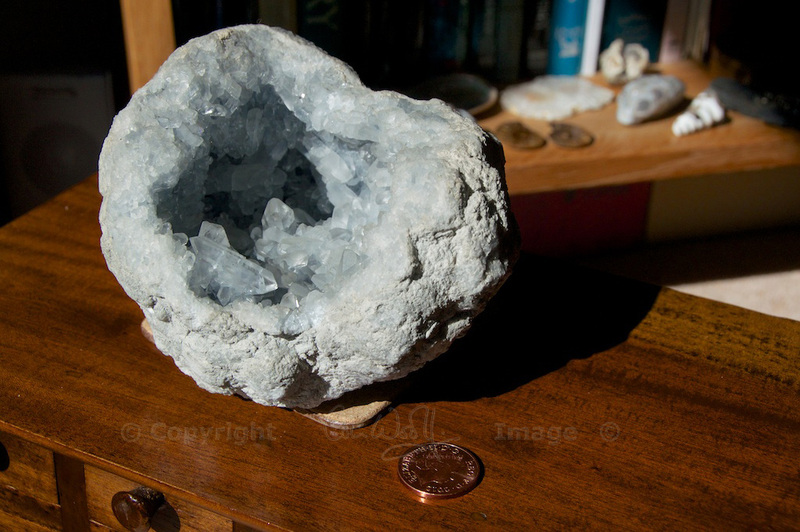 One of the biggest mineral specimens I have is a geode of celestine. It is perhaps seven inches across at its widest point (that’s a two-pence piece for comparison) and it weighs nearly 6 lb (2.7 kg) in weight. In shape it’s like a partly squashed sphere, with one side cut away to reveal a Merlin’s cave of pale blue crystals – celestial blue, because that’s where the name comes from. It was found in Madagascar; I know this, because a friend brought it back with him after a visit there many years ago. 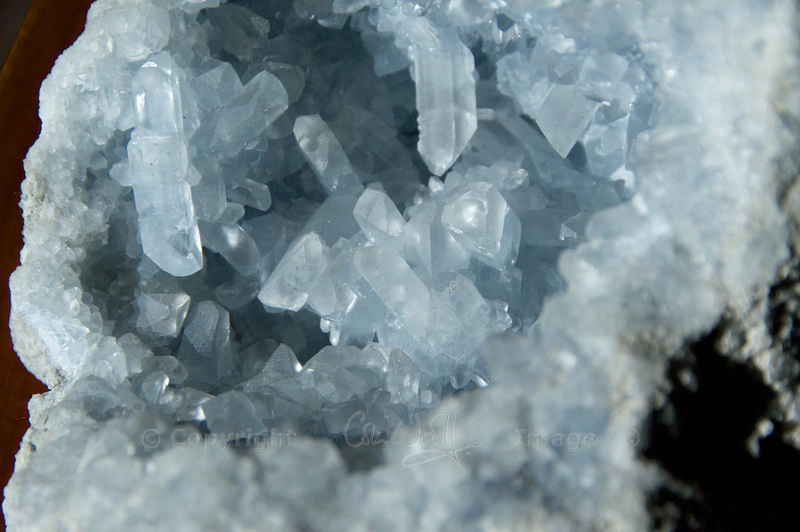 Celestine (or celestite) is a natural form of strontium sulphate, and it occurs in sedimentary rocks throughout the world. It can also be found in the cavities of volcanic rocks. According to geologists, there are good sources in Sicily, Poland, Mexico and (surprisingly) in South Gloucestershire, England, where it was mined for strontium in the 19th and 20th centuries. On South Bass Island in Lake Erie, USA, there is a celestine cavern so big that you can go inside and walk around. Few photos are available but the crystals look to be cloudy or opaque rather than clear. For mineral collectors, the source of the most beautiful celestine specimens is still Madagascar. The celestine that was mined in England was taken to Germany where the strontium extracted from it was used in the refining of sugar beet. Amazingly, when this practice was at its peak, 90% of the world’s supply of celestine could be traced to a quarry near Bristol. This quarry has now closed, and, as one keen amateur geologist observed rather sadly, a shopping centre has been built on top of it. I was interested to read that strontium is used in fireworks, as it burns with a brilliant crimson flame. 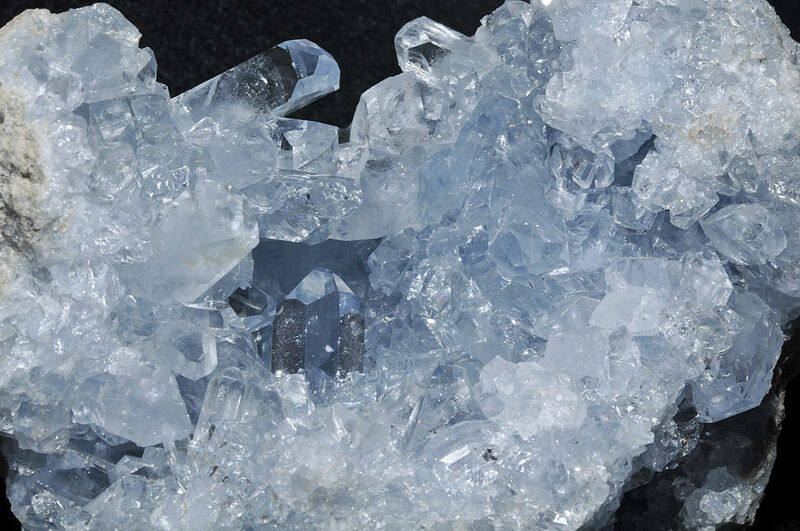 In its purest form celestine is colourless: the delicate light blue shade comes from impurities within the rock. This colour may fade in strong sunlight. Because it is quite soft and brittle, celestine is seldom used for carving, and in jewellery it is usually kept in its natural state. 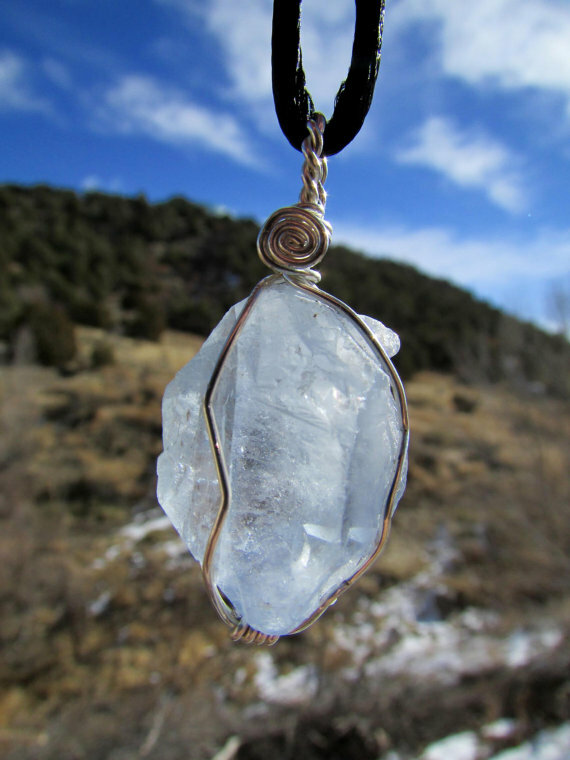 (My thanks to the owner of the Etsy shop Sequoia’s Roots for allowing me to reproduce this photo of a beautiful celestine pendant). My own geode is fragile: the outer surface is powdery, and it is very prone to crumble when touched. Over the years I’ve collected a handful of tiny shards of crystal that have fallen out of the centre. However, I don’t like storing it away in a cupboard: crystals should be enjoyed and admired! In ancient times, celestine was said to promote peace, harmony, truth and wisdom, and the Greeks and Romans believed that it had the power to drive away evil. Some websites claim that celestine originated in the Pleiades star cluster, which is an intriguing theory. I should add that these websites are New Age/astrological rather than scientific. Making contact with your guardian angels, giving courage to public speakers, recollecting dreams, bringing calm to chaos – celestine is said to be useful for all these things. or take a look inside one of my favourite crystal and fossil shops – Mr Wood’s Fossils in Edinburgh. Oh thats so interesting, when we were in Whitby in 2012, Steve bought one just like this, but it was in 2 parts that match and it looks like an egg when placed together, with a crusty outer layer. So pretty inside as you say like a little sparkly cave inside, mine is about 9 inches high when put together, it might not be the same but is very similar. That sounds like a lovely rock, Lynne! Are the crystals the same colour as celestine? I bet it weighs a ton, too! I have heard that Whitby beaches are great for stones and fossils. It sounds as if they have a great rock shop, too! What a beautiful pale blue. I think it’s nice that you handle your lumps of rock even when they’re fragile. It’s rather sad to see them tucked away inside cabinets never to be touched. It’s lovely, isn’t it? I can still remember the surprise and delight when I was given it. I have to admit to actually washing this geode out on occasions, because it collects dust and I can’t see how else to clean it. Geologists would probably be horrified, but I am very gentle with it! The biggest problem is the powdery shell which I have to keep dry. Rocks do seem to collect dust, don’t they? I suppose it’s all the little nooks and crannies that make it inevitable. What you say about washing them reminds me of a friend of mine who inherited an oil painting. It was needing a clean so he stuck it in the bath and scrubbed at it with a brush and Fairy Liquid. It came up a treat, but I imagine the very idea would horrify professional picture restorers. Haha, that was brave, especially with Fairy Liquid! If that got around, it would probably put some professional restorers out of business!! Yes, rocks do collect dust, and this one had been on the kitchen windowsill for a while – perhaps not the wisest location, so he’s now in the sitting room. I have a piece of Celestine on my desk that a friend gave me a few years ago and although I was aware of the spiritual aspects, I wasn’t aware of the history and science, so thank you for teaching me something new again! I’m very glad you enjoyed this, Andrea, thank you! I always learn something myself when I read about crystals. What happens if the outside of a celestite egg is crumbling a lot? Will my geode fall apart or will it have crystals all around? Big chunks were falling off when I moved it from my porch. It had been in a box on layaway for years before I saw it and took it home. I felt it needed some fresh air but didn’t expect it to crumble so much.